We all know hunters who are proud of their skills as an archer, so proud in fact that it would not be unlikely they were buried with their bow and arrows. Well it turns out not much has changed in 600 years. Russian villagers have discovered the burial site of what looks to be a warrior who lived around the 13th to 15th century who apparently had a talent for archery similar to the legendary Robin Hood. The archer was found buried with a birch bark quiver, arrow shafts and iron arrow heads, indicating some prominence for the warrior. He was also found alongside intricate ornaments and utensils made from the roots of trees and the remnants of silk ribbons, the Siberian Times reported. It appeared from the find that this particular warrior was held in respect. His quiver was wrapped in silk ribbons. And alongside they found a leather strap they believed attached the quiver to his belt. Archaeologists have still not opened the sarcophagus but they are hopeful that it might contain the archer’s bow. For researchers anxious to get to the burial site, they will have to wait until April. Already they are concerned that locals may have disturbed the area or removed something. ‘We are doing all we can to ensure the safety of the grave in winter and to ensure the security of other archaeological objects. 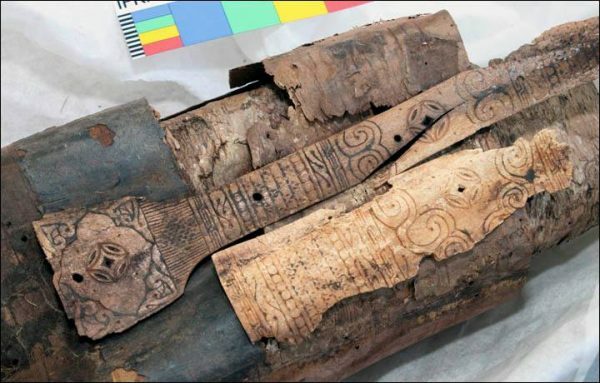 I have many questions to how these items were found,” Vasily Oinoshev, director of the Agency for Cultural and Historical Heritage of the Altai Republic, told the Siberian Times.